All stud earrings come with medium weight ear nuts. 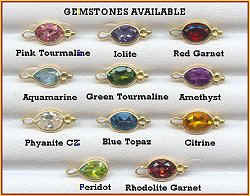 Go to bottom of page for genuine gemstones available. Please click on picture to enlarge for detail & to order. Several sizes in CZ and genuine gemstones available. Shown in Phyanite cubic zirconia..
We have these earrings available in many of the genuine gemstones shown here. By clicking on the above pictures, you will be taken to an enlargement of the shape of the earrings shown and the size and gemstone options will be available. At the present time, white gold is not available for this line.